The West Vancouver Highlanders will return to the Provincial Championship after a seven year hiatus with their victory over the Handsworth Royals in the AAAA Howe Sound Championship game earlier tonight. The West Van victory marks the third year in a row where the Howe Sound regular Season Champions have not been able to make it to the Provincial Championships. West Van seemed to be able to score at will in the first quarter and got off to an impressive start leading 23-9 at the end of the first quarter. Handsworth seemed tense early in the game and had trouble converting from close proximity to the hoop. The Highlanders poured it on in the second quarter and stretched their lead to 19 midway through the second quarter and it looked like the game might get out of hand early, but Handsworth fought back and closed the gap to 11 at the halftime break. West Van played as a unit, it did not matter which five players were on the floor, the ball moved, they played great team defence smothering Handsworth at every opportunity. They were selfless and they were very effective. Tournament MVP Luke Ryan took over the game in the second half scoring 25 of his 26 points. Ryan was able to score at the hoop, he scored from the perimeter, he scored from the could line and pretty well anywhere he wanted to as the Highlanders never allowed the Royals to close the gap top less than 9 in the second half. Ryan was also awarded the "NO REGRETS" player of the final game by the Quinn Keast Foundation. Matt Fedak had 13 points to complement Ryans 26, and was selected to the tournament All-Star team along with teammate Phillip Jessic. Jessic had another very strong night for the Highlanders doing all the little things that coaches love. He rebounded well and went to all the dirty areas of the court picking up a nasty cut along the way, but that is the price one pays for a Howe Sound Championship. Ken Krohman who has been coaching West Van for the last four years was elated after the game, "I couldn't be prouder of our boys, the week was a huge challenge playing against great teams night after night. We played with grit and we played for each other. I think the guys will remember this week for a long, long time." For the second consecutive night, the high scoring Royals seemed to have trouble adjusting to the physical nature of the Howe Sound Tournament. League leading scorer Adam Karmali had 24 points in the final and was selected to the Tournament All-Star team along with team mate Finn Killam. Austin Penrose of the Sentinel Spartans rounded out the all-star team. West Vancouver will play in the Telus AAAA Provincial Championships in March at the Langley Events Centre. The West Vancouver Highlanders picked up where they left off last night, playing together as a unit and getting after every loose ball which proved to be more than Handsworth could handle. The victory forced a final deciding game in the double knockout tournament which will be played on Thursday night, 6pm at Sutherland Secondary School. Both teams started tentatively recognizing the importance of the game. The score was knotted at 12 after the first quarter as the both teams were challenged to find their rhythm on offence. In the second quarter West Van started to move the ball effectively on offence, and the Handsworth defence broke down allowing West Van to get to the basket or hit wide open jumpers from the perimeter. West Van was starting to get on a roll and took a 30-22 lead into the locker room at the half. Handsworth clawed back late in the third quarter and cut the lead to 5 points after West Van had extended their lead to as many as 12. A cloth 3 by Matt Fedak closed the quarter and West Van led 44-36 at the break. 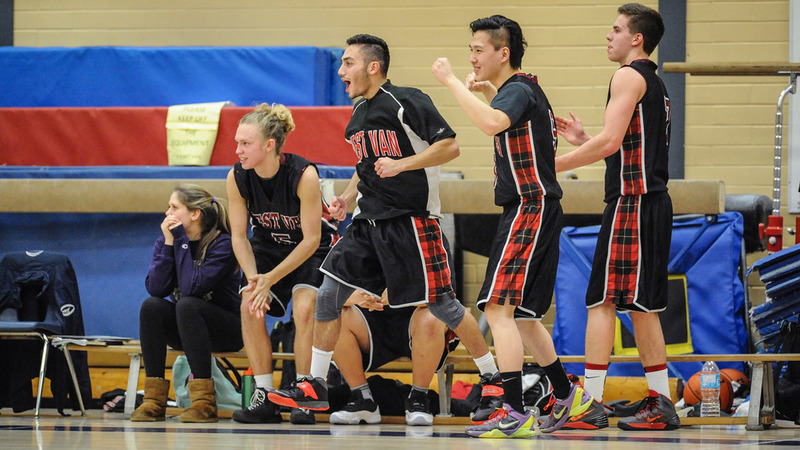 West Van took care of business in the fourth quarter and went on to a 63-46 victory. The Highlanders were once again led by their backcourt duo of Luke Ryan and Matt Fedak who had 24 and 14 points respectively. Luke Ryan had his best game of the tournament and was selected Player of the Game for his efforts. 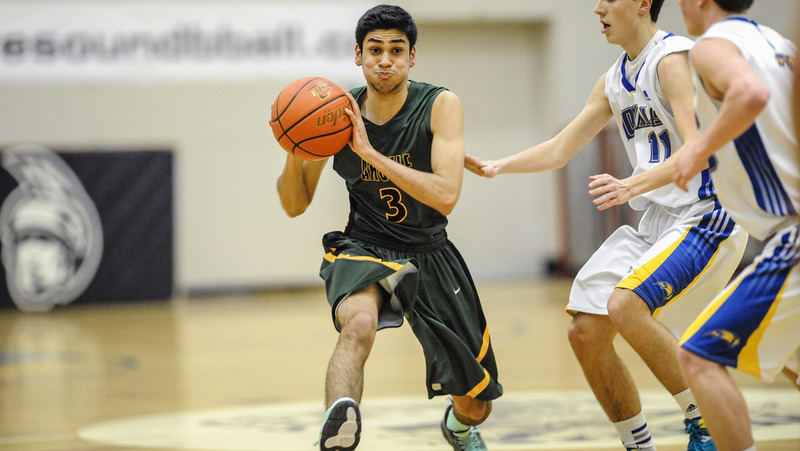 Adam Karmali was the leading scorer for Handsworth with 15 points. The West Vancouver Highlanders played one of their best game of the year when it counted. The Highlanders got out to an early lead going up 19-8 after the first stanza behind the hot hand of Matt Fedak who had 9 points in the first quarter. Sentinel made a push in the second quarter but West Van answered back and built the lead at halftime to 33-2-. Sentinel changed things up in the second half applying full court pressure but West Van dissected the pressure with perfection and extended the lead to 19 points at the end of three and cruised to a 72-46 victory to advance to the AAAA Howe Sound Finals to face Handsworth. The last time West Van made it to the Finals was in 2007 when they took 2 straight over the same Handsworth Royals who were the #1 team in the Province at that time led by one Robert Sacre ! The Highlanders seem to be peaking at the right time, their ball movement on offence was impressive as was their commitment to team defence. Matt Fedak led the Highlanders with 22 points but it may have been the balanced scoring in the balance of the lineup that was the key for West Van. Austin Penrose had 15 point for Sentinel in a losing cause. Tomorrow's game goes at 6pm at Sutherland, when the Handsworth Royals will attempt to defend their Howe Sound title. West Van will need to beat Handsworth twice, while Handsworth needs only one victory to claim the 2014 AAAA Howe Sound Championship. Handsworth headed to the locker room at halftime nursing a 4 point lead, and it looked like the much anticipated game between the Royals and Spartans would be another classic Howe Sound Playoff game. That was not the case. We have no idea what the halftime discussions were in the locker rooms, but clearly one worked and the other did not. Handsworth dominated the third quarter outscoring the potent Spartans 23-11, and cruised to a 69-40 victory in what had to be the biggest surprise of the evening. "This is not done yet," said Handsworth captain Adam Karmali, " we know the history of this tournament, and you just have to look at the last two years where the team that has had the bye, was not able to close it out, and we need to break that trend." Karmali was brilliant again for the Royals with 32 points, many from long range, and was selected Player of the Game for Handsworth. Kevin Franklin got going from outside early in the third quarter and chipped in with 9 points for the Royals who now will play on Wednesday against the winner of west Van and Sentinel which will be played tomorrow night at 6pm at Sutherland. The West Van Highlanders may have been guilty of looking ahead and for a while it looked like they had overlooked the Pipers of Argyle but in the end a strong third quarter was enough to allow the Highlanders advance to tomorrow night's sudden death game against Sentinel. West Van was up 16-10 at the end of the first quarter and it looked like they may be on their way but a superb effort by Argyle in the second quarter meant the teams were locked at 31 each going into halftime. "We had a pretty good chat with the guys at the break," said Highlanders Coach Ken Krohman, "and i felt better about the way we started the 3rd quarter." West Van outscored argyle 26-8 in the third quarter and went on to a 74-44 victory to earn a spot in tomorrow night's sudden death matchup against cross town rival Sentinel. 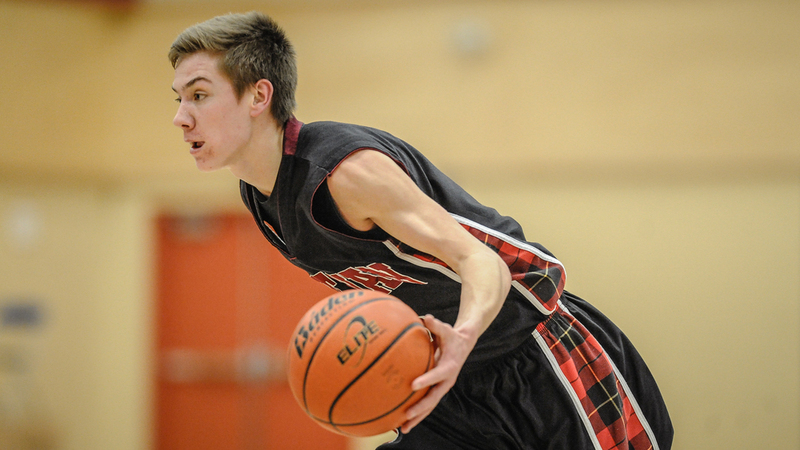 West Van were led by Luke Ryan and Alex Yoon who had 23 and 15 points respectively. Ryank was selected Player of the Game. Ryan Vancise with 16 points and Zach Holt with 12 points were the leading scorers for the Pipers. The Handsworth Royals got off to a slow start but by early in the second quarter the final result was never in doubt. The Royals took a 11 point lead to the locker room and built that lead to 26 points by the end of the 3rd quarter and cruised to a 63-35 victory against the Argyle Pipers. Handsworth used their entire lineup and the scoring was well balanced. Adam Karmali, who led the league in scoring was Handsworth's leading corer with with 15 points. Kevin Franklin was selected Player of the Game with 12 points, all from outside the arc. Finn Killam and Tyrone Karius had 11 points each. Argyle's Ryan Vancise led all scorers with 18 points. The Sentinel Spartans held the West Vancouver Highlanders to 2 points in the 4th quarter to squeak out a 57-48 victory in the late game of the 4A Howe Sound Championship. The game was a tightly fought contest where neither team was able to sustain momentum for long periods of time. The Spartans took a 2 point lead to the locker room at the half but West Van was up 39-35 after five minutes of play in the third quarter, and built that lead to 6 points by the end of the third quarter. It looked like West Van was ready to pull off the upset but Sentinel adjusted and went to a triangle and 2 defence in the 4th quarter which proved very successful. Braeden Fitzpatrick hit a 3 with 4 minutes remaining to put Sentinel up 49-48 and the Sentinel defence shut the door as they outscored West Van 17-2 in the final quarter. Braeden Fitzpatrick led all scorers with 19 points and was selected Player of the Game for Sentinel. Grade 10 guard Triston Matthews also had a strong game for Sentinel with 14 points. The West Vancouver backcourt tandem of Mike Fedak and Luke Ryan combined for 29 points with Fedak leading West Van scorers with 15 points and Ryan had 14. Sentinel will now play Handsworth on Monday night and West Van will play Argyle in an elimination game.